Not to be confused with Thompson Twins, Cocteau Twins were a dream-pop band form Scotland. Between 1982 and 1996 the group released nine albums of original music, including a 1996 collaborative disc with sometime Brian Eno associate Harold Budd. 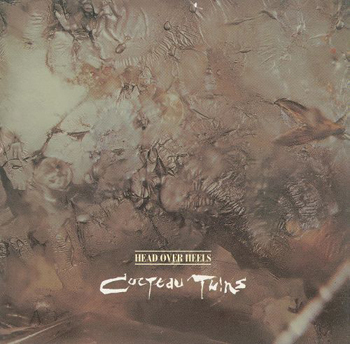 Cocteau Twins’ sound was a distinctive, gauzy melange that often sounded as if it had been recorded through thick curtains and from mics pleased blocks away from musicians playing at deadening volume. There’s a glacial, disembodied feel to the band’s music, one that endeared it to a generation of goth fans. 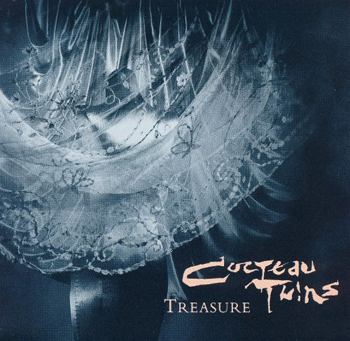 Melodies are often buried deep inside the band’s sometimes dissonant arrangements, and Cocteau Twins’s music always emphasized the “dream” part of dream-pop, sometimes making few concessions at all to the pop side of the equation. As often as not, the vocals served as part of the sonic mix rather than as a means to tell any kind of story. Cocteau Twins’ sound was a sort of blissed-out answer to Jesus and Mary Chain. 1983’s Head Over Heels was the band’s second release, a highly-regarded followup to the relatively undistinguished debut, Garlands. Casual and/or first-time listeners may not discern a world of difference between Head Over Heels and 1994’s Treasure. The group’s signature sonic elements were in place, and Cocteau Twins would continue to mine similar musical territory with varying degrees of success on subsequent albums. But in fact, Treasure features a leap forward in terms of melodic pop sensibility. The lead-off track “Ivo” sports a memorable melody buried within its trademarks layers of sonic gauze, and Elizabeth Frazer’s vocals are lively, even if it’s something of a chore to suss what she’s singing about. And “Lorelei” is an even stronger composition, with transcendent, countermelodic vocal lines and chiming synthesizer patches. If you can’t spring for both albums, Treasure clearly gets the nod. Beggars Arkive’s beautiful 2018 vinyl reissues of Head Over Heels and Treasure include the expected download card. The vinyl is black, and the sound reproduction is – by Cocteau Twins standards – crystalline. This review is part of a week-long series covering new vinyl releases and/or reissues, including titles scheduled for special release on Record Store Day 2018, this coming Saturday (April 21). Please support your local independent record store.